The USDA released its 2016 California Almond Crop Objective Estimate, projecting a crop of 2.05 billion lbs. The estimate was based on the 900,000 bearing acres released in April, resulting in a projected yield of 2,280 lbs./acre. 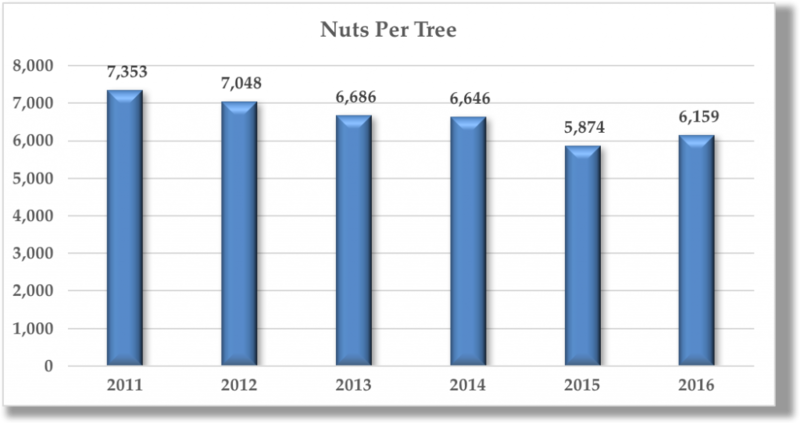 The nut count per tree increased 4.9%, to an average of 6,159 per tree for the 2016 crop. This remains well below the counts from 2011 through 2014. The average kernel weight increased 3.5% from last year’s estimate, growing to 1.48 grams from 1.43 grams in 2015. 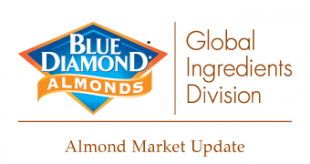 The outlook for the 2016 crop has been in the 2.10 to 2.15 billion lb. range in recent weeks. The Objective Estimate reduces risk that the 2016 crop is above that range. With the 900,000 bearing acres representing a trailing indicator, perceptions of the crop will remain largely unchanged. Pricing on current and new crop has been in a relatively tight band, and is likely to remain that way for the foreseeable future. The moderate increase in projected supply bodes well for more stable pricing and a more predictable environment as the 2016 crop is harvested and sold. The next data update is the ABC Position Report scheduled for Tuesday, July 12.